Tents of Hope Was a Great Success! 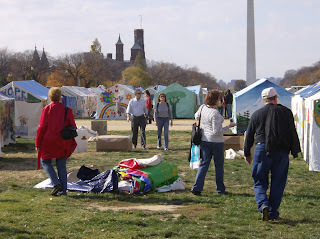 Over the weekend of November 7-9th, hundreds of tents from around the United States and the world converged on the National Mall in Washington DC. 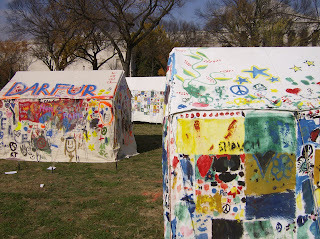 These tents, beautifully painted, were created to bring attention to the crisis in Darfur, Sudan. Organized by the Tents of Hope Campaign, this event was a huge success. Tents from UU congregations sat near tents from Catholic and Protestant parishes, Jewish temples, college campuses and community organizations. Together, they made a beautiful tapestry of color and a message for peace. With the Washington Monument and Capitol Building acting as backdrops and the music of local and Darfurian musicians, this was a stunning and powerful experience. Activists and tourists alike wandered the tents learning about the condition s of refugee camps in Darfur and Chad. Organizations like Save Darfur, UU Service Committee, and Amnesty International helped participants learn about the conflict in Darfur and how to help those most affected by the violence and displacement. 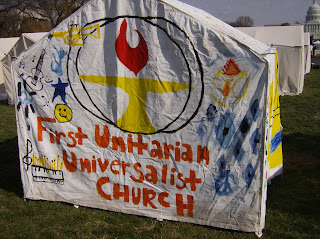 Many UU Congregations, including All Souls Church, Unitarian in Washington DC; The UU Congregation of Kent, Ohio; First UU Church of Dallas, Texas; and the UU Legislative Ministries of Maryland all provided tents. Many more congregations utilized the postcard campaign for Darfurian women organized by the UU Service Committee. Several of the tents used this weekend will be sent to Darfur and Chad to act as schools, health clinics and shelters in Darfurian refugee camps. Tents of Hope was the September Action of the Month for the UU Advocacy and Witness Team. For more information on the Actions of the Month, please visit uua.org/socialjustice. Thanks for the info about Tents of Hope! Too Shy to Stop photographer Shaun Bell was able to take some pictures of the event, which you can view here.